The Raiders signed some expensive big-name free agents shortly after the market opened, and traded for another just before that. The depth chart thickened after that, leaving few positions demanding attention from the NFL draft. Make no mistake: upgrades or potential would be welcome most anywhere, but there are few spots where the Raiders can't survive without more bodies. The whole NFL world knows there's an exception. The Raiders need quality and quantity edge rushers after failing to find free-agent fits in a market with so many elite pass rushers franchise tagged. The Raiders have Arden Key, recently added veteran Benson Mayowa, run stopper Josh Mauro and AAF graduate Alex Barrett and ... that's it. Edge rusher/defensive end is a need so glaring it might work against the Raiders in this NFL draft. Teams know how bad they need one or, more likely, two in this draft. There's depth in this defensive line class, but true impact players generally go high. We could see teams jump ahead to snag one before the Raiders, but general manager Mike Mayock said that's not unique to his particular situation. "People are looking at what we need, just like we're looking at what they need," Mayock said Thursday in his pre-draft press conference. "We're doing the same thing. Who might need this position? Who might jump ahead of us? Where do we need to go to get that guy because team ‘X' needs a ‘whatever' position. That's all part, I think, of the intrigue, the game of poker that this is." Poker is made tougher when competitors know what you need most. Opposition research is prevalent, and the Raiders will have a strong sense of where teams will lean on draft day, but coming out of the first four picks without a dynamic edge rusher, even if Alabama interior lineman Quinnen Williams goes at No. 4, puts the Raiders in a pickle. 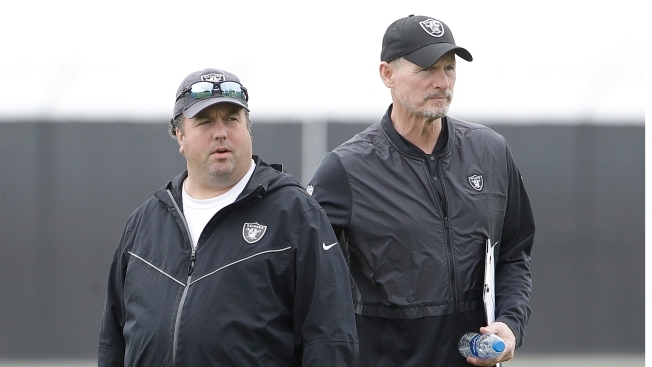 Going for the best available may be wise in the long run, but will the Raiders be able to work their way into a quality edge rusher (or two) with trades or luck or pre-draft deception? They seemed set on offensive tackle last year once the elite prospects were gone, with Mike McGlinchey and Kolton Miller as top options. They traded down an got the tackle they wanted and needed. They would jump the moon if Ohio State's Nick Bosa shockingly fell to No. 4 this year. Josh Allen is considered a top 5 pick. Montez Sweat and Rashan Gary should be gone in the top 10. Clelin Ferrell and Brian Burns are likely gone before the Raiders pick again at No. 24. The Raiders must address other needs as well, and don't want to extended beyond the draft board too far with so many top draft slots available. Mayock says the Raiders need four foundational players in this draft, regardless of position. One of them better be an edge rusher, sparking the age-old debate of best player versus need. "I'm the son of a coach and I know how coaches think, and coaches think need," Mayock said. "And we are a coach-driven building, our coaches are highly involved and that's good. I embrace that. The flip side is you can't reach, you got to use some common sense and that's what I preach upstairs. Is that if we are in a situation where if two similarly rated players and one is a higher position of need, great, let's go get him, but if there is a discount, a disparity between two let's not reach for need because the more you do that, the more you dilute your roster, and that's a conversation we've had a lot."